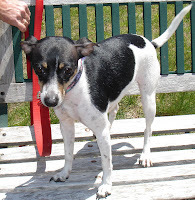 Medfield Animal Shelter News: Where have all the adopters gone? We have had several very slow adoption weeks and are chock full of pets in need of homes. Hopefully people are just too busy with end of the the school year activities to think about adding a new pet to their home and things will return to normal soon. The Rat Terrier (that's her in the photo) picked up by Dover Animal Control on Wednesday still hasn't been claimed by an owner, much to our surprise. She is a cute and sweet dog, but she is a barker and is driving the poor conures crazy.